Or is this something a little deeper? I began laughing about half-way through when I think I twigged to what he was pointing at. Luke’s having some metafun. I don’t want to spoil it too much, but I thought it was delightful. He drops some random things in there, playing with our expectations – all without spoiling it too much. He’s telling his own story, the review is flawed in some ways, but you actually start seeing a bit of his genius in a way. I thought I knew where the review was going but by the end of the podcast I must admit that he is way cleverer than I am. It’s a classic (review). Don’t blame me if you don’t stick with it. 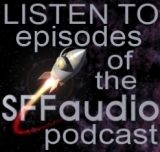 That all said, do not make this your first SFBRP podcast – start elsewhere. Heh. This WAS the first SFBRP podcast I listened to. I was kind of hoping that’s what was going on.